Hexadecimal NumbersTwo other forms of number representation can be used to represent integers. They are Octal and Hexadecimal (Hex for short) systems. The first has a base of 8, the second a base of 16. Click Octal number representation to learn about the Octal system. Hexadecimal is 16 based and uses the digits 0 to 9 and the letters a to f to represent the values 0 to 15. Letters are used after values past nine as two digits can not be used. Hexadecimal is used more often than octal as any four bits of a binary number can be converted into its hexadecimal equivalent and vice-versa. The number 345 in hexadecimal is 837 as a decimal. An eight bit binary number can be converted into its hexadecimal equivalent easily. For example, convert 11111111 into hexadecimal. (The answer is ff). Convert these into hex: 15 => f, 15 => f.
Concatenate them: f and f => ff. Hexadecimal works well with binary because 4 bits is half of a byte and bytes are one of the basic binary measuring units. E.g. Kilobytes, Megabytes, Gigabytes. Hexadecimal is often used as a more concise way of expressing a large binary number. A. The new Internet Protocol (version 6) system uses 128 bits and hexadecimal is used to abbreviate this very large number. Also, MAC numbers for internet adapters use 48 bits and are expressed in hexadecimal. An example MAC address is C4 46 19 73 49 70. To see the IP address and MAC number of a Windows computer open a command prompt and type ipconfig /all, then Enter. The MAC number is the physical address reading. B. Computer monitors use a red, green and blue colour system.This is also know as RGB for short. Each pixel on the screen is a combination of different strengths of each of the three colours. In a 24 bit colour system a byte, 8 bits (24/3 = 8), is used for each colour. The maximum value a byte can hold id 28 - 1 = 255 (take 1 away to allow for zero). A value of 255, or ff in hex, means the colour is used at its full strength. A value of 0, or 00 in hex, means none of the colour is used in the overall mix of colours. Note: upper or lower case letters can be used when writing hex, so ff is equivalent to FF. C. In HTML red, green and blue colour values are often expressed in hexadecimal. There are six hex numbers in a colour; two for each colour. Reading from the left the first two represent the strength/amount of red in the colour, the next two the strength of the green and the last two the strength of the blue. In mathematics and digital electronics, a binary number is a number expressed in the binary numeral system, or base-2 numeral system, which represents numeric values using two different symbols: typically 0 (zero) and 1 (one). The base-2 system is apositional notation with a radix of 2. Because of its straightforward implementation in digital electronic circuitry using logic gates, the binary system is used internally by almost all modern computers and computer-based devices. Each digit is referred to as a bit. Using 4 bits there are 24 (16) different combinations of zeros and ones, 0000 being the smallest and 1111 the largest. There is a simple formula to work out the largest decimal number that can be represented by a certain number of bits all set to 1. It is 2 to the power of the number of bits minus 1. One is taken off because the system starts at 0. 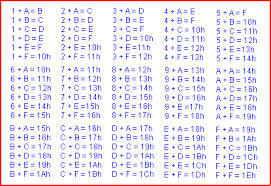 So, using four bits the following decimal numbers can be represented: 0,1,2,3,4,5,6,7,8,9,10,11,12,13,14,15. This is sixteen numbers in all. Particular bit patterns have names. Four bits is called a nibble, eight bits is called a byte, four bytes is called a word. Using the formula above a byte can represent a maximum decimal value of 28 - 1, or 255. Different systems within a computer can use different numbers of bits. For example, most modern processors can read/write 64 bits of data at a time from/to RAM, whereas the Windows 7 operating system comes in both 32 and 64 bit versions. For various reasons the 32 bit version limits the amount of RAM it can address to around 3 Gigabytes, so anything above this figure is useless. -> For more reading click here.